1. 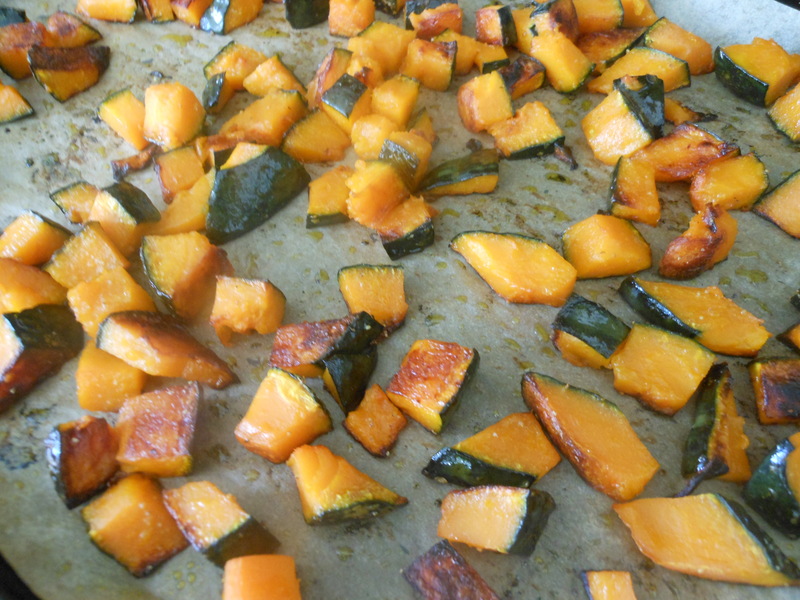 Preheat the oven to 400′, place the prepared squash on a parchment lined baking sheet. Drizzle the squash with olive oil and season with salt and pepper. Roast for 20-25 minutes, just until slightly browned. 2. While the squash is roasting place a big soup pot on the stove over medium heat. 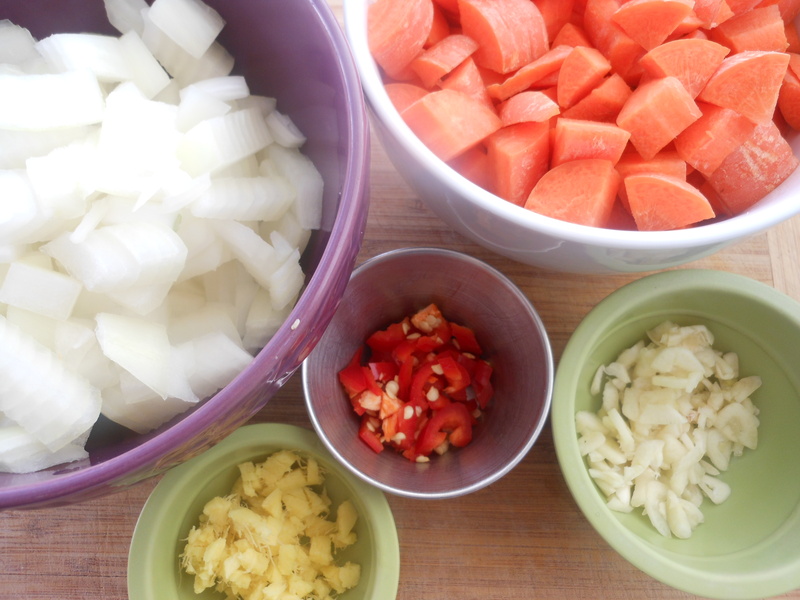 Start with heating up th coconut oil, when oil is hot drop in the onions and carrots, season with a pinch of salt and pepper. Saute for about 5-10 minutes. 3. Next add the garlic, ginger and chile. Stir and saute for another five minutes. 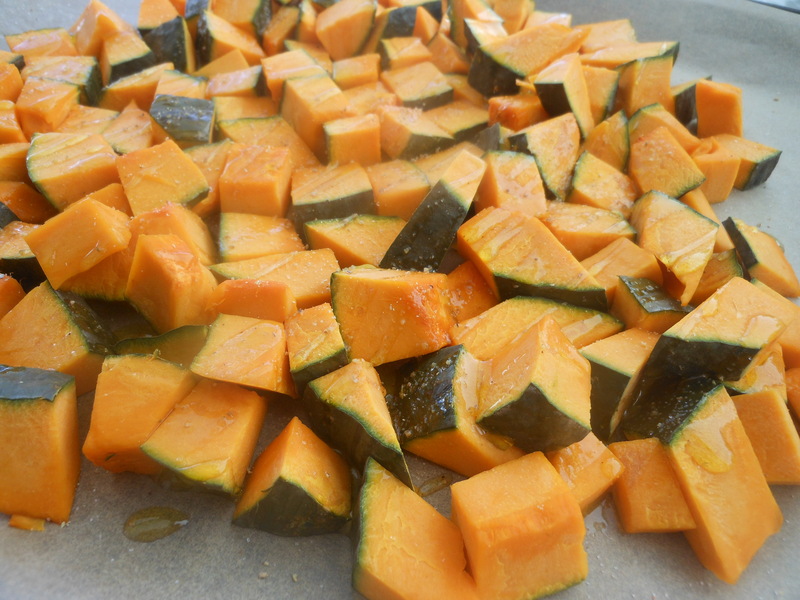 When the squash is done roasting add it to the pot along with the liquid aminos and mirin. Stir to combine. 4. Add the broth and the water, bring to a boil then turn down to med-low and simmer for 20 minutes. After the soup has simmered, let cool for just a bit. Puree in batches in your blender (leave some room for the steam to escape) or use a hand-held immersion blender (thank goodness I have one of these, worth investing in). Add in the lime juice and zest if using, stir. Just before you are ready to ladle the soup into bowls place 1 tsp. in the bottom of each bowl and ladle the warm soup over the miso. Stir to make sure the miso melts well into the soup (miso is a living food and boiling destroys its beneficial enzymes). Serve hot! Kabocha- Like other richly colored vegetables winter squash are an excellent source of carotene’s, the richer the color the richer the concentration such as pumpkin and acorn. Like other carotene-rich vegetables, winter squash have been shown to exert a protective effect against many cancers, particularly lung cancer. Carrots- Two carrots (not baby carrots) provide roughly 4,050 retinol equivalents, or roughly four times the RDA of vitamin A. Carrots also provide excellent levels of vitamin K, biotin, and fiber and very good levels of vitamins C, B6, potassium and thiamine. Chile Peppers- They help dissolve bloods clots, opens up sinuses and air passages. Breaks up mucus in the lungs, and acts as an expectorant or decongestants. Antibacterial, antioxidant activity, great immune booster. Putting hot chili sauce on food also speeds up metabolism, burning off calories. I have been loving my kabocha squash, and since this was the last of it I wanted to do something different. This soup was just the ticket, it was warm and nourishing and perfect for the cold week we just had. If you don’t have kabocha squash use your favorite winter squash, but next year at the farmer’s market keep your eye out for this super-food beauty of a squash. 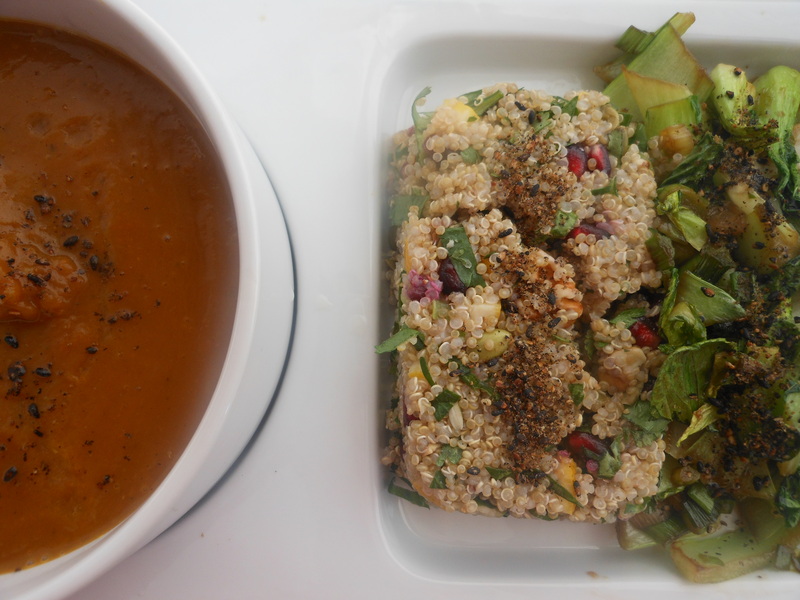 I served this soup with a side of Happy New Year Quinoa Salad and sautéed baby bok choy. Enjoy!